The Mech: the Epsilon mech is equipped with Pulse Cannons, an EMP Burst Pack and Overdrive software overrides. It can support blades, shields and undercarriage units. Permanent upgrades are available to movement and attack speed in the form of limb repulsors, and to the Pulse Cannons as Super-EMP, Biowaste and Fire mod kits. 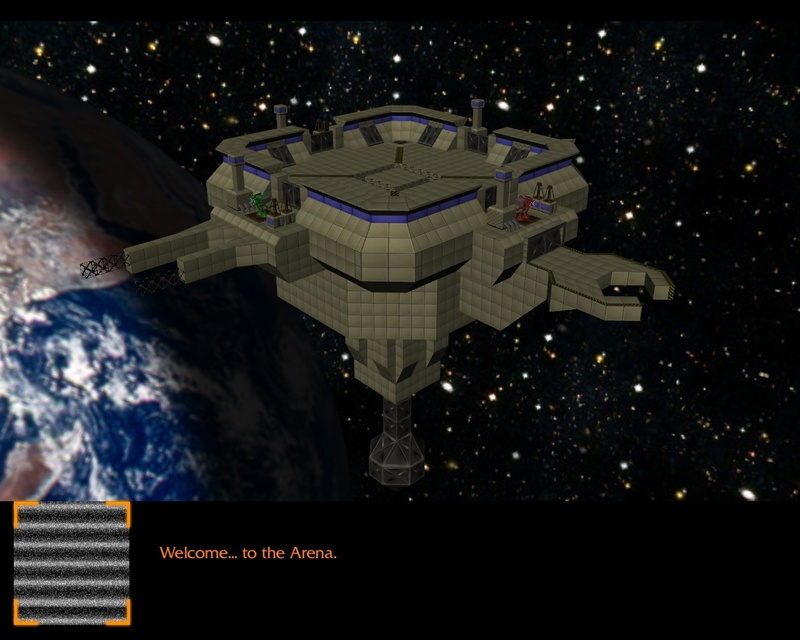 The Bases: each player has a home base outside the combat arena. Only the player may enter his or her home base; other players attempting to cross the threshold will be immediately destroyed. 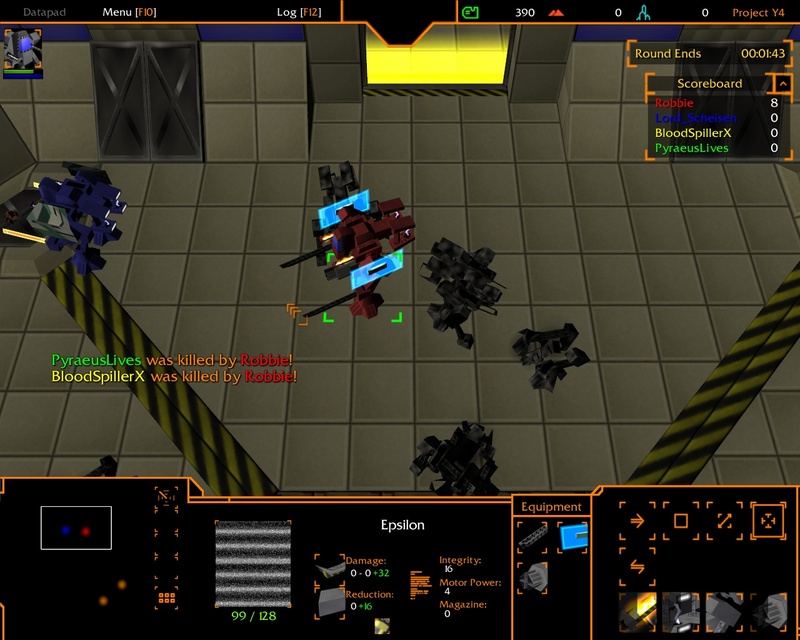 The home base offers equipment and upgrades, and upon death the player’s mech will be rebuilt here. The Arena: the Arena is a large, open compound. In the centre of each edge is the entrance to a player’s home base, and at each corner is an item spawn point. Between each home base gate and each corner, there is a “pit” gate that spawns drone enemies. This image isn’t quite as good as Concrete Hands but I’m still going to spam it everywhere. Not much to it, then. The layout is small and simple — nice and easy does it. Pipedream: a variable control point in the centre of the arena that changes (randomly?) each round. I’m thinking things like a controllable gun turret, a UT “Healpod” (complete with trap activated by Pulse Cannonning switches)… Maybe A02 if I can be bothered. 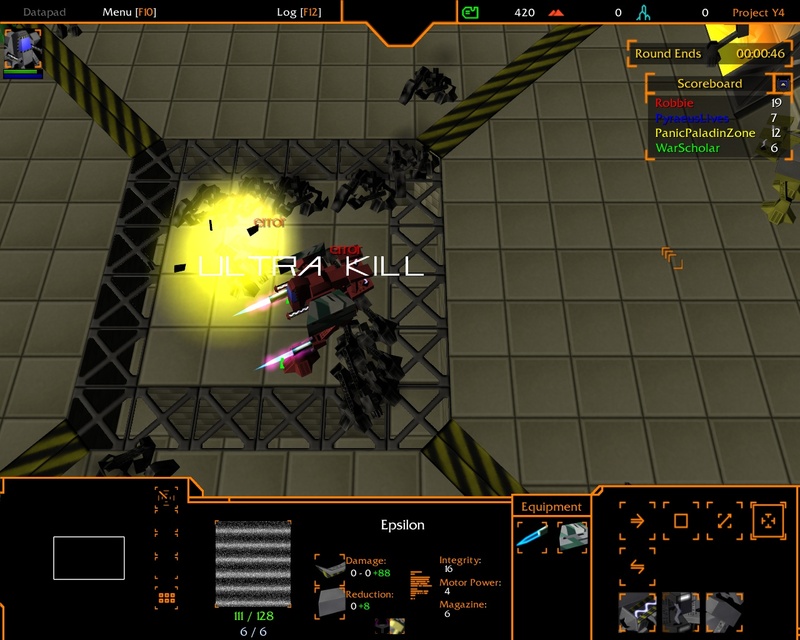 The Objective: kill opponents to gain points. The player with the most points wins. 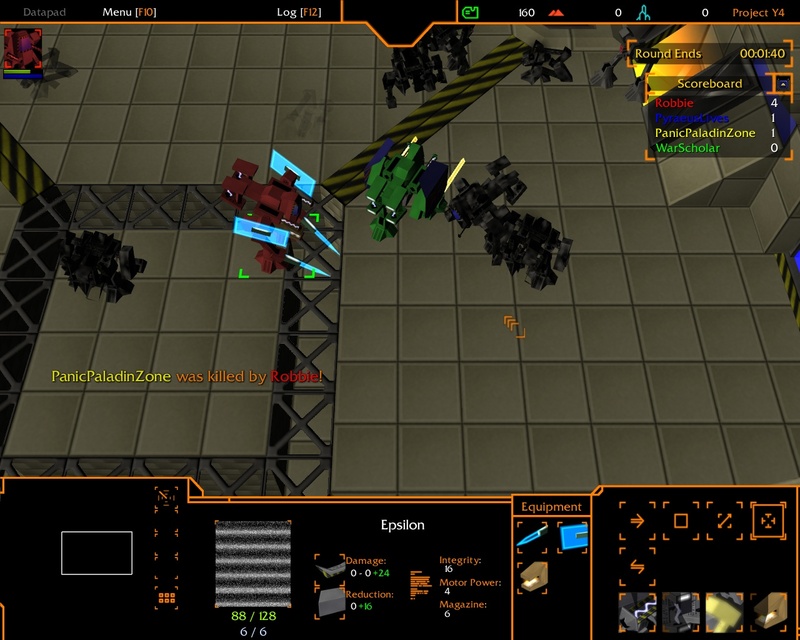 Players are awarded 4 points for killing another player, and 1 point for killing a drone. The Structure: the game is split into 10 rounds. Rounds are time-limited and score-limited: ideally the score limit will be reached far before the time limit, but whichever comes first will trigger score analysis and the player with the highest score will be announced the winner. Between rounds there is a short pause to allow players to collect themselves and consider upgrades before the next round. The Reward: after each round, players will be awarded monies commensurate with their performance during the round. They can use these monies to better their mechs with equipment, upgrades or repairs during and between each round. Witty death messages may or may not make a reappearance. The objective is even easier. Kill wild animals! Kill players! Kill everything! I think paying people based on how well they do is going to add up to hideous snowball, but it’s just a bit o’ fun and even the “best” equipment has its downsides: the Thaelite Axes and Concrete Shields have crippling speed penalties, the GEP Gun and Hate Cannon have stupid cooldowns… So hopefully even a less well-equipped player can grab the UDamage and tear down a more advanced player. I’m not even sure I expect anyone to get the maximum tier before the end. Some measure of choice in your path through the middle rounds is expected, balancing upgrades versus equipment and your own play style. Rinse and repeat rounds until you’ve played 10 of them and an overall winner is announced. Then, we can think about some global reset system so you can just keep on playing until it’s just you and the bots. The supremacy of the bots was short-lived as I learned to abuse them terribly. The Bots: no matter how many players join a match, there will always be four contenders as empty or abandoned slots will immediately be taken over by bots. 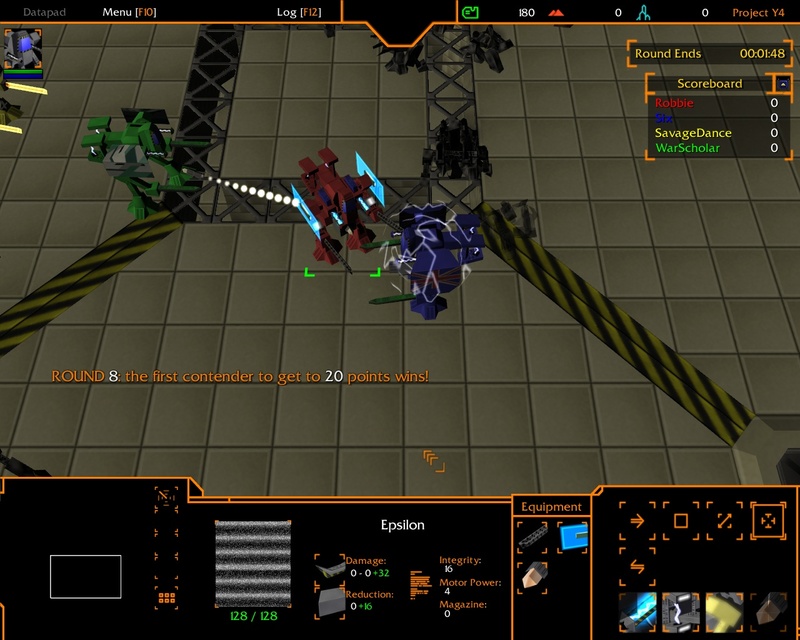 The bots have instructions to wander around the arena and attack whatever they find, but they will prioritise opposing player mechs that engage them and will make full use of their abilities. Between rounds, they will also spend their money on new equipment and upgrades. The GEP gun is always the most silent way to win the Arena. As for balance… what balance? The item roster is straight out of Project Y4 and so may be brutally overpowered. Minor adjustments were made during testing, but I still want things to be big and highly explosive. It’s not like you’ve got a set number of lives anymore. Hey, this is what you get when a dedicated singleplayer makes a multiplayer map! Now quit yo’ jawin’ and get to ModDB! This entry was posted in Modding, Project Y4, Warcraft III and tagged Arena Y4, map, mod, project y4, rdz industries, released by Rao Dao Zao. Bookmark the permalink. Tried this out the other yesterday when my internet went down. It is hella fun. did you put secrets in this map?? or will you put secrets in the next versions of this map?? There are no secrets in Arena Y4. It is no more and no less than what you see. Steal their kills back harder! I donno- I preferred starcraft….